I love stained glass. Isn't this lovely? Some people are so creative! Do you realize that when you have that love of creating, it's because He has put a bit of that part of Himself in you? He created all we see - this entire world, the universe, everything that exists. He is the original artist! He clearly loves beauty as we can see from all He has created. How cool that He is sharing His love of creating beauty with us, not only in our getting to live in this world, but that we get to create a little too and so have the opportunity to commune with Him in another way?!?!? Awsome! That's really beautiful. God's wonders never cease to amaze, don't they? Thank you for your generosity. 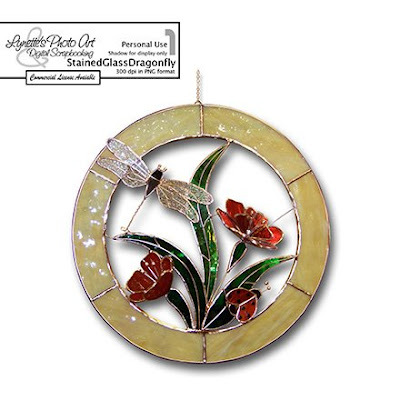 This stained glass ornament is so pretty. I love the dainty look of the dragonfly's wings. Thanks so much Lynette.